I was reading an article about Bobby Flay on Inc.com the other day and I came across an interesting comment that he made. It revealed his intentional use of content marketing to build his brand and his name. The article was called How Bobby Flay Built a Sizzling Empire and it was written by Christine Lagorio-Chafkin. “When The Food Network came along, I was like, ‘A 24-hour food channel? They’re going to run out of stuff in a week.’ They had no money to fly people in, so if you could get there by subway, you could get on a show. A lot of chefs didn’t want to do it. I’m like, ‘Well, you guys are missing the point, because every time I’m on TV, I’m gonna get people to understand that I own a restaurant, and I’m gonna put more asses in the seats.’ I came up with my own show ideas. I created Throwdown and Beat Bobby Flay. Did you catch that? Read the part of the quote that I bolded again. He didn’t just do a show on Food Network for the fun of it. He did it for the express purpose of promoting his restaurant and getting more people to come to it. 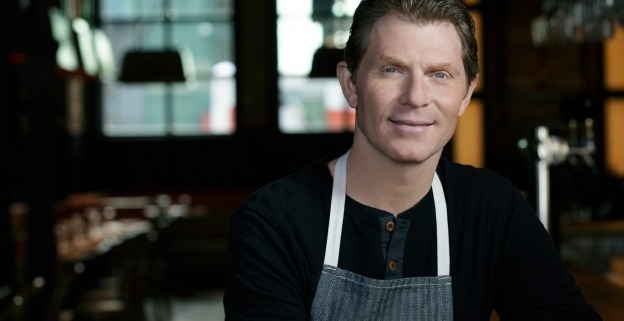 There are a lot of great chefs whose restaurants aren’t doing as well as Bobby Flay’s restaurants are. What’s the difference? Why are Bobby’s restaurant’s doing so much better? Because Bobby has harnessed the power of content marketing. This method that Bobby Flay used is one of the “content marketing hacks” that I mention is my book 51 Content Marketing Hacks. In chapter 26 titled, “How Walt Disney Used Content Marketing to Launch and Finance Disneyland,” I tell how Walt Disney used a very similar strategy. The Wonderful World of Disney TV show (originally called Disneyland) was the thing that enabled Walt to raise the $17 million he needed to build Disneyland. Not only that, but it was the vehicle that he used to promote the park before it was even opened. There are so many websites, publications, media outlets, and other organizations that are in continual need of content. They need it badly enough that some will even pay you for it. This is the ultimate hack. How incredible would it be to be paid to indirectly promote yourself or your business? Aim for that as your goal. And even if they won’t pay you to create content, you still win. How? Because you still get to create content that promotes your business on other people’s channels. As I said in my book…It all starts with you beginning to create content. You have to start. You have to begin writing or recording your ideas. Put them on a blog. Do something! Until you start, it’s hard to get a chance to produce content for someone else. And if you never start, it’s going to be even more difficult to get paid for your content. It takes practice to become good at anything and content creation is no different.